FREDERICK, Md. — Philip Goldberg turned the handle on a heavy metal door, opening it to reveal a white-walled room bathed in yellow light. Below those lamps were plants, sitting atop platforms, stretching toward the ceiling while supporting large, green flowers covered in sugar-like crystals. The plants were marijuana — a substance that for decades was considered an illicit drug but has now found legitimacy as medicine. “Medical cannabis really is medicine,” Goldberg said. Goldberg is the CEO of Green Leaf Medical LLC, which operates licensed growing and processing facilities in Maryland and has expanded into other states. That expansion is expected to continue, as Goldberg and his team await word on approval from the Pennsylvania Department of Health for a Bedford County growing facility. “The Saxton facility is a dream come true,” Goldberg said, explaining the Department of Health is likely to decide on the site by mid-August. This month, Goldberg led a tour through a 45,000-square-foot building in Frederick, Md., which supports 32 employees. There, thousands of plants are cultivated, harvested, packaged and shipped to approved Maryland dispensaries. Goldberg showcased nearly every step of that process, using a keycard to access rooms, each containing thousands of dollars worth of equipment or product. “Everything we do here is controlled access,” he said, explaining each employee carries a similar card, tracking them as they enter rooms and prohibiting them from entering others. Those employees also were subjected to a rigorous interview process, including both state and federal background checks, Goldberg said. “It’s just about surrounding yourself with professionals that really know their trade,” he said. Physical security measures were farther reaching than just the use of keycards. Shortly after entering the building’s adjacent parking lot, a large, armed guard appeared from behind a locked gate in a fence blacked out with material to obscure visibility. Atop that fence, spools of razor wire were unraveled, and even dumpsters containing unused and discarded plant parts were locked. Inside of the building, each room was under the surveillance of a sophisticated camera system monitored by guards. Those guards are on hand to make sure that there is no mishandling or theft of the several thousand plants on site at a given time, Goldberg said. Plants get their start in one of three ways at Green Leaf — by seed, cloning or tissue culture. More complex, tissue culture refers to a process by which existing plants’ cells are used to create new growth, resetting a strain to remove any problems, such as disease, Goldberg said. Growth begins in an area known as the “veg” room. There, small, juvenile plants and large mothers are kept under lamps that turn on and off in a programmed light cycle, which discourages flower growth. The goal is to keep those plants in a vegetative state until space is made so they can be moved to already full flower rooms, where plants grow to maturity. It was in the flower rooms that Goldberg began the tour, showing off flowering plants that filled the air with marijuana’s distinct, skunky smell. Advanced agriculture technology helps, too. A sophisticated closed-loop irrigation system, programmed lighting, regulated carbon dioxide disbursement and powerful dehumidifiers were among the features Goldberg highlighted. And because pesticides and similar chemicals are not part of Green Leaf’s process, predatory mites and nematodes play a role in removing harmful bugs from growing plants. The result is mature plants of different strains, supporting flowers both big and small. Goldberg pointed out those differences, showing the small flowers of the LA Chocolate strain, which are laden with trichomes — small crystalline hairs. The trichomes and LA Chocolate flowers are high in tetrahydrocannabinol, or THC, the plant’s psychoactive component. Other plants, like Painkiller XL, are low in THC, while high in cannabidiol, or CBD, which often is lauded for its medicinal benefits. While concentrations of solely CBD are available, Goldberg stressed that medical cannabis is most effective when the whole plant is consumed. “You need the entourage effect,” he said, explaining the entourage effect is a term used to define the blending of all of marijuana’s active compounds, known as cannabinoids. From the flower rooms, marijuana crops are transported to harvest rooms, where plants are stripped to little more than a stems attached to their largest flowers. Smaller flowers and other usable plant parts are removed and later sent to an Ocean City, Md., processing facility, where they are turned into vaporizable oils, topical ointments and other legal products, Goldberg, a Maryland native, said. Trichomes also are removed and turned into a powdery, high-THC product called kief, which can be sprinkled atop regular marijuana when smoked to increase its effect. So far, smoking medical marijuana is illegal in Pennsylvania, according to the Department of Health. At Green Leaf’s facility, the larger flowers still on their stems are then taken to a drying room, where they are cured. During the tour, Green Leaf employees could be seen taking cured flowers down from a drying rack to fill large plastic tubs. Each cured strain is then sent for lab testing before it is packaged for distribution, Goldberg said. Part of that packaging process was revealed as Goldberg showed a nearly two-story machine used to weigh and package flowers in containers that hold an eighth of an ounce each. In the same room, a smaller device could be used to roll 100 marijuana cigarettes — typically called joints — in a minute. The cigarettes are sold in plastic tubes of two. Packaged and processed medical marijuana is then shipped securely to licensed dispensaries, where patients who qualify can purchase it. For the most part, Goldberg discourages the use of words like “joint, weed and pot” because he feels they carry negative connotations rooted in the plant’s illegal past. But when it comes to product names, tradition remains. A harvesting schedule displayed on a wall included types of plants, or strains, with names like Pineapple Skunk, Grease Monkey, Sour Diesel and Cookies and Cream. Those names are holdovers, often given by illegal growers prior to medical legalization. And for a period of time, Goldberg said he considered doing away with those names, too. “We almost did, and let me explain why we didn’t,” Goldberg said. Prior to medical legalization, many people suffering illnesses chose to self-medicate by seeking out and purchasing marijuana illegally, he said. Through trial and error, they may have found strains that best help to treat their symptoms, and to change those names now would undo the now-legal patients’ understanding of what plants are best for them, Goldberg said. Goldberg isn’t shy about marijuana’s transition from illegality to legitimacy, answering candidly when asked how his company received its first plants. “It’s exactly what you think,” he said, with a slight smirk. All told, the Frederick facility produces about 450 pounds of marijuana a month. A pound of flowers sells for about $3,500, Goldberg said. That’s because each facility constructed by the company — which has more than 100 investors — is a multi-million dollar endeavor with ongoing expenses, including competitive salaries, Goldberg said. 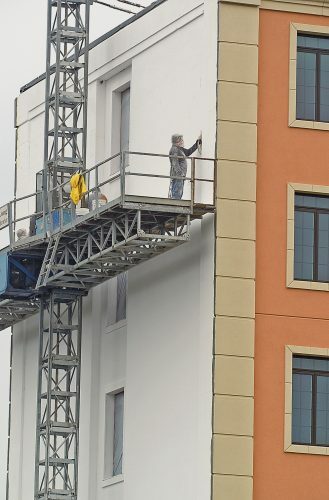 At the Frederick site, monthly electric bills are about $40,000, he said. Goldberg also spoke about the high cost of the growing permit application process — a process that is now ongoing in Pennsylvania. Pennsylvania’s Medical Marijuana Program was signed into law in April 2016, and in a first round of permitting, 12 grower/processors were licensed to operate within the state. 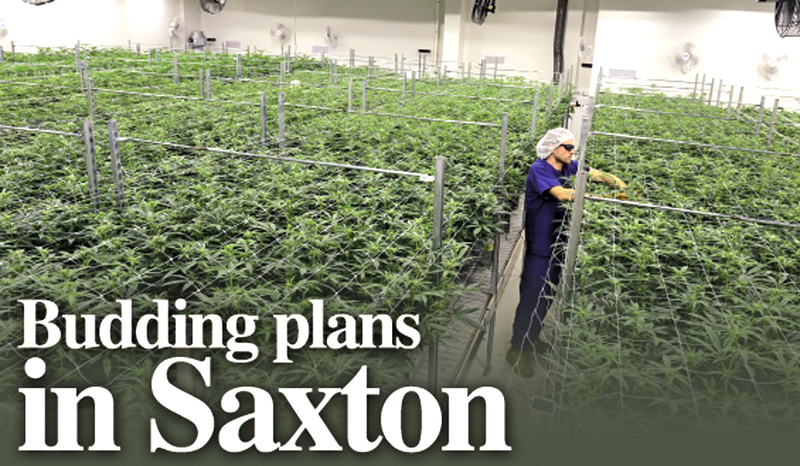 Green Leaf filed an application in that first round, hoping to secure a permit to begin a grow operation at Saxton’s former Seton Leather plant — a site about three times the size of the Frederick facility. Each application is scored, and permits are given to the highest scorers in each of the state’s six regions, a Pennsylvania Department of Health spokeswoman said. Green Leaf’s application fell short in the first round — by only about 3 points. Green Leaf scored 719, losing to the two south-central permit winners at 744 and 722 points, according to the state. “We just barely missed it the first time around,” Goldberg said. Now, a second round of permitting is underway, and Green Leaf leaders have been working hard to prepare the best possible application while building relationships with Saxton business leaders and officials. That includes Saxton Mayor Alan Smith, who last year praised the economic implications of a local marijuana operation in a depressed area rife with opioid drug abuse. If approved, the Saxton facility could employ about 100 people, Goldberg said. In the second round, 13 permits will be awarded — two in each region and one to the highest scorer overall. However, more than 90 applications have been submitted, including nine in the Mirror’s coverage area — three in Bedford County and one in Huntingdon County in the southcentral region, two in Centre County in the northcentral region and three in Cambria County in the southwest region, Department of Health information shows. Department of Health spokeswoman April Hutcheson said permits will be awarded by the end of the year. During the recent tour, Goldberg said he is confident his company will be in Saxton before too long.